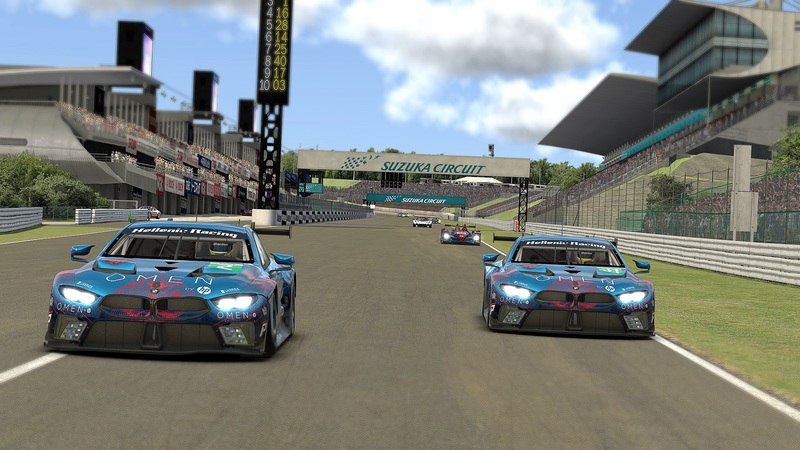 This Sunday we had the first race of the newly created championship Sports Car Open that is organized by Core Simracing. 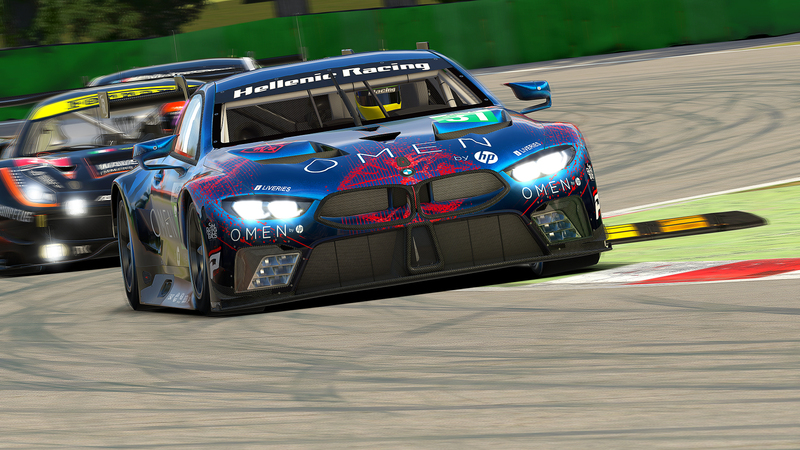 We have registered two cars Hellenic Racing Blue and Hellenic Racing Red both in GTC category. Both teams are competing behind the wheel of a Ferrari 488 GT3. 54 cars in 3 categories and the first race was in Nürburgring Grand-Prix-Strecke BES/WEC. 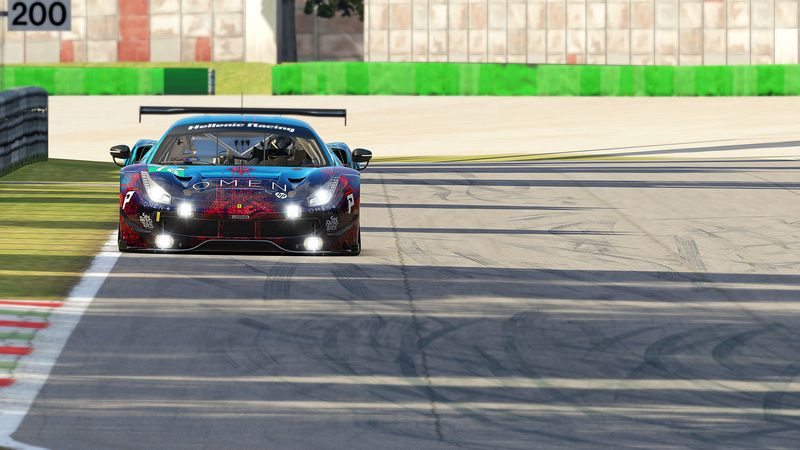 We had a very good qual lap for blue car P3. Red had some issues in first lap and only managed to start eleventh in the category. but the big gap between the three categories during the start process made the first wave of HPDs come very early in lap 4. This made the track even busier and harder to keep concentration both in managing traffic and to have clean passes from the leading cars. Andreas had an accident when he tried to avoid two cars that had contact in turn 6. He touched the grass and the car spun in the middle of the truck and got hit by the upcoming traffic. That resulted in a big damage so the race to the checkered flag for Perrs, Arvanitantonis and Vezirtzoglou was pretty match a good training for the following rounds. The final position was p14. On the other hand Nestoras had a solid first stint and managed to gain back 3 lost positions. Bill kept the rhythm going when he had his own turn behind the wheel and gave the car back to Nestoras in the same spot P2. The gaps between the first three cars were big and it was clear that without any mistakes the order could not be changed. When the clock marked the 4 hour mark the race ended with Hellenic Racing Blue on the podium making an excellent start in this first race of SCO. 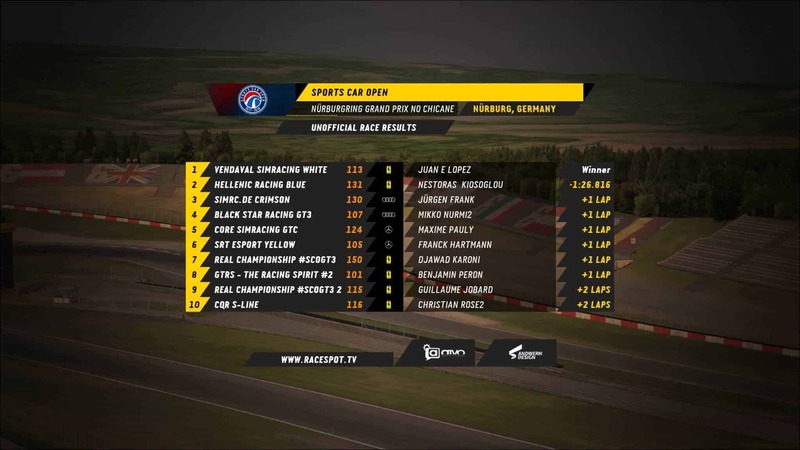 Congratulations to Thrustmaster Mivano Racing, Vendaval Simracing Blue and Vendaval Simracing White for their win in the each category, and to all participants for the exciting first event, especially to simrc.de for the clean and fair fight for many laps! Also to organizers for a good start in their new adventure.